Subacute cutaneous lupus erythematosus (SCLE) is a nonscarring, non–atrophy-producing, photosensitive dermatosis. SCLE commonly develops in sun-exposed areas, including the upper back, shoulders, extensor arms, neck, and upper torso, while the face is often spared. These skin lesions can appear as either papulosquamous (psoriasiform) or annular lesions. SCLE is a subtype of cutaneous lupus erythematosus (CLE); other subtypes include acute cutaneous lupus erythematosus and chronic cutaneous lupus erythematosus. Chronic cutaneous lupus erythematosus includes discoid lupus erythematosus, lupus erythematous panniculitis/profundus, lupus tumidus, and chilblain lupus. Early lesions of subacute cutaneous lupus erythematosus may simulate polymorphous light eruption. SCLE lesions heal without scarring or atrophy, but they may result in dyspigmentation, which can be prominent. Severe systemic disease is unusual, but when it occurs, the patient may develop life-altering sequelae. Patients with a deficiency of the second component of complement (C2d) often manifest SCLE lesions as part of their SLE-like disease. Worldwide, subacute cutaneous lupus erythematosus (SCLE) prevalence ranges from 17-48 cases per 100,000 persons, while the incidence of cutaneous lupus erythematosus (CLE) is 4.3 cases per 100,000 persons and that of SCLE specifically is 0.63 case per 100,000 persons. The highest prevalence of systemic lupus erythematosus (SLE) occurs in patients aged 40-60 years. The male-to-female ratio of SLE is approximately 1:10. The male, to-female ratio of CLE is approximately 1:2-3. Of patients with CLE, 10-50% have SCLE. SCLE is more common in whites (>85%). The male-to-female ratio of SCLE is 1:4. The condition typically occurs in patients aged 15-70 years, with the mean age being approximately 43 years. It is estimated that 50% of patients with SCLE meet criteria for having SLE, and approximately 10% of SLE patients have SCLE lesions. Subacute cutaneous lupus erythematosus (SCLE) uncomplicated by severe systemic lupus erythematosus (SLE) has a good prognosis. Some patients may manifest spontaneous remission; however, most have chronically active disease or a course punctuated by intermittent exacerbations. Exacerbation in the spring or summer is common. By definition, skin lesions heal without scarring or atrophy but may leave residual dyspigmentation. Instruct patients about sun-avoidance techniques, the use of sun-protective clothing, and the appropriate use of broad-spectrum sunscreens. Because subacute cutaneous lupus erythematosus (SCLE) is exacerbated by sunlight or other UV light exposure, advise patients to take precautions. One precaution is to discourage exposure to sunlight between the hours of 10 am and 4 pm. While this is beneficial to some patients, many are so exquisitely photosensitive that this alteration does not help. In addition, advise patients to avoid artificial light sources, such as tanning beds. Discuss the expectations for prognosis. Patients should be educated on the systemic manifestations of systemic lupus erythematosus (SLE) and be followed regularly for these. Biazar C, Sigges J, Patsinakidis N, Ruland V, Amler S, Bonsmann G, et al. Cutaneous lupus erythematosus: first multicenter database analysis of 1002 patients from the European Society of Cutaneous Lupus Erythematosus (EUSCLE). Autoimmun Rev. 2013 Jan. 12(3):444-54. [Medline]. Lin JH, Dutz JP, Sontheimer RD, Werth VP. Pathophysiology of cutaneous lupus erythematosus. Clin Rev Allergy Immunol. 2007 Oct. 33(1-2):85-106. [Medline]. Braunstein I, Klein R, Okawa J, Werth VP. The interferon-regulated gene signature is elevated in subacute cutaneous lupus erythematosus and discoid lupus erythematosus and correlates with the cutaneous lupus area and severity index score. Br J Dermatol. 2012 May. 166(5):971-5. [Medline]. [Full Text]. Klein LR, Elmets CA, Callen JP. Photoexacerbation of cutaneous lupus erythematosus due to ultraviolet A emissions from a photocopier. Arthritis Rheum. 1995 Aug. 38(8):1152-6. [Medline]. Grönhagen CM, Fored CM, Linder M, Granath F, Nyberg F. Subacute cutaneous lupus erythematosus and its association with drugs: a population-based matched case-control study of 234 patients in Sweden. Br J Dermatol. 2012 Aug. 167(2):296-305. [Medline]. Reed BR, Huff JC, Jones SK, Orton PW, Lee LA, Norris DA. Subacute cutaneous lupus erythematosus associated with hydrochlorothiazide therapy. Ann Intern Med. 1985 Jul. 103(1):49-51. [Medline]. Bentley DD, Graves JE, Smith DI, Heffernan MP. Efalizumab-induced subacute cutaneous lupus erythematosus. J Am Acad Dermatol. 2006 May. 54(5 Suppl):S242-3. [Medline]. Bezerra EL, Vilar MJ, da Trindade Neto PB, Sato EI. Double-blind, randomized, controlled clinical trial of clofazimine compared with chloroquine in patients with systemic lupus erythematosus. Arthritis Rheum. 2005 Oct. 52(10):3073-8. [Medline]. Cassis TB, Callen JP. Bupropion-induced subacute cutaneous lupus erythematosus. Australas J Dermatol. 2005 Nov. 46(4):266-9. [Medline]. Farhi D, Viguier M, Cosnes A, Reygagne P, Dubertret L, Revuz J, et al. Terbinafine-induced subacute cutaneous lupus erythematosus. Dermatology. 2006. 212(1):59-65. [Medline]. Wiznia LE, Subtil A, Choi JN. Subacute cutaneous lupus erythematosus induced by chemotherapy: gemcitabine as a causative agent. JAMA Dermatol. 2013 Sep. 149(9):1071-5. [Medline]. Brunasso A, Aberer W, Massone C. Subacute lupus erythematosus during treatment with golimumab for seronegative rheumatoid arthritis. Lupus. 2014. 23(2):201-3. [Medline]. Wilkerson E, Hazey MA, Bahrami S, Callen JP. Golimumab-exacerbated subacute cutaneous lupus erythematosus. Arch Dermatol. 2012 Oct. 148(10):1186-90. [Medline]. Lowe G, Henderson CL, Grau RH, Hansen CB, Sontheimer RD. A systematic review of drug-induced subacute cutaneous lupus erythematosus. Br J Dermatol. 2011 Mar. 164(3):465-72. [Medline]. Durosaro O, Davis MD, Reed KB, Rohlinger AL. Incidence of cutaneous lupus erythematosus, 1965-2005: a population-based study. Arch Dermatol. 2009 Mar. 145(3):249-53. [Medline]. Cohen MR, Crosby D. Systemic disease in subacute cutaneous lupus erythematosus: a controlled comparison with systemic lupus erythematosus. J Rheumatol. 1994 Sep. 21 (9):1665-9. [Medline]. Sontheimer RD. Subacute cutaneous lupus erythematosus. Clin Dermatol. 1985 Jul-Sep. 3 (3):58-68. [Medline]. Callen JP, Kulick KB, Stelzer G, Fowler JF. Subacute cutaneous lupus erythematosus. Clinical, serologic, and immunogenetic studies of forty-nine patients seen in a nonreferral setting. J Am Acad Dermatol. 1986 Dec. 15(6):1227-37. [Medline]. Tiao J, Feng R, Carr K, Okawa J, Werth VP. Using the American College of Rheumatology (ACR) and Systemic Lupus International Collaborating Clinics (SLICC) criteria to determine the diagnosis of systemic lupus erythematosus (SLE) in patients with subacute cutaneous lupus erythematosus (SCLE). J Am Acad Dermatol. 2016 Feb 18. [Medline]. Tebbe B, Mansmann U, Wollina U, Auer-Grumbach P, Licht-Mbalyohere A, Arensmeier M, et al. Markers in cutaneous lupus erythematosus indicating systemic involvement. A multicenter study on 296 patients. Acta Derm Venereol. 1997 Jul. 77 (4):305-8. [Medline]. David-Bajar KM, Bennion SD, DeSpain JD, Golitz LE, Lee LA. Clinical, histologic, and immunofluorescent distinctions between subacute cutaneous lupus erythematosus and discoid lupus erythematosus. J Invest Dermatol. 1992 Sep. 99 (3):251-7. [Medline]. Rothfield N, Sontheimer RD, Bernstein M. Lupus erythematosus: systemic and cutaneous manifestations. Clin Dermatol. 2006 Sep-Oct. 24 (5):348-62. [Medline]. Hejazi EZ, Werth VP. Cutaneous Lupus Erythematosus: An Update on Pathogenesis, Diagnosis and Treatment. Am J Clin Dermatol. 2016 Feb 12. [Medline]. Herzinger T, Plewig G, Röcken M. Use of sunscreens to protect against ultraviolet-induced lupus erythematosus. Arthritis Rheum. 2004 Sep. 50(9):3045-6. [Medline]. Stege H, Budde MA, Grether-Beck S, Richard A, Rougier A, Krutmann J. Evaluation of the capacity of sunscreens to photoprotect lupus erythematosus patients by employing the photoprovocation test. Eur J Dermatol. 2002 Jul-Aug. 12(4):VII-IX. [Medline]. Kuhn A, Gensch K, Haust M, Meuth AM, Boyer F, Dupuy P, et al. Photoprotective effects of a broad-spectrum sunscreen in ultraviolet-induced cutaneous lupus erythematosus: a randomized, vehicle-controlled, double-blind study. J Am Acad Dermatol. 2011 Jan. 64(1):37-48. [Medline]. Chang AY, Piette EW, Foering KP, Tenhave TR, Okawa J, Werth VP. Response to antimalarial agents in cutaneous lupus erythematosus: a prospective analysis. Arch Dermatol. 2011 Nov. 147(11):1261-7. [Medline]. [Full Text]. Francès C, Cosnes A, Duhaut P, Zahr N, Soutou B, Ingen-Housz-Oro S, et al. Low blood concentration of hydroxychloroquine in patients with refractory cutaneous lupus erythematosus: a French multicenter prospective study. Arch Dermatol. 2012 Apr. 148(4):479-84. [Medline]. Hofmann SC, Leandro MJ, Morris SD, Isenberg DA. Effects of rituximab-based B-cell depletion therapy on skin manifestations of lupus erythematosus--report of 17 cases and review of the literature. Lupus. 2013 Aug. 22(9):932-9. [Medline]. Housman TS, Jorizzo JL, McCarty MA, Grummer SE, Fleischer AB Jr, Sutej PG. Low-dose thalidomide therapy for refractory cutaneous lesions of lupus erythematosus. Arch Dermatol. 2003 Jan. 139(1):50-4. [Medline]. Sticherling M, Bonsmann G, Kuhn A. Diagnostic approach and treatment of cutaneous lupus erythematosus. J Dtsch Dermatol Ges. 2008 Jan. 6(1):48-59. [Medline]. Usmani N, Goodfield M. Efalizumab in the treatment of discoid lupus erythematosus. Arch Dermatol. 2007 Jul. 143(7):873-7. [Medline]. Manzi S, Sánchez-Guerrero J, Merrill JT, Furie R, Gladman D, Navarra SV, et al. Effects of belimumab, a B lymphocyte stimulator-specific inhibitor, on disease activity across multiple organ domains in patients with systemic lupus erythematosus: combined results from two phase III trials. Ann Rheum Dis. 2012 Nov. 71 (11):1833-8. [Medline]. Cortés-Hernández J, Avila G, Vilardell-Tarrés M, Ordi-Ros J. Efficacy and safety of lenalidomide for refractory cutaneous lupus erythematosus. Arthritis Res Ther. 2012 Dec 7. 14(6):R265. [Medline]. [Full Text]. Cusack C, Danby C, Fallon JC, Ho WL, Murray B, Brady J, et al. Photoprotective behaviour and sunscreen use: impact on vitamin D levels in cutaneous lupus erythematosus. Photodermatol Photoimmunol Photomed. 2008 Oct. 24(5):260-7. [Medline]. Klaeschen AS, Wenzel J. Upcoming Therapeutic Targets in Cutaneous Lupus Erythematous. Expert Rev Clin Pharmacol. 2016 Jan 22. [Medline]. James JA, Kim-Howard XR, Bruner BF, Jonsson MK, McClain MT, Arbuckle MR, et al. Hydroxychloroquine sulfate treatment is associated with later onset of systemic lupus erythematosus. Lupus. 2007. 16(6):401-9. [Medline]. Jung H, Bobba R, Su J, Shariati-Sarabi Z, Gladman DD, Urowitz M, et al. The protective effect of antimalarial drugs on thrombovascular events in systemic lupus erythematosus. Arthritis Rheum. 2010 Mar. 62(3):863-8. [Medline]. 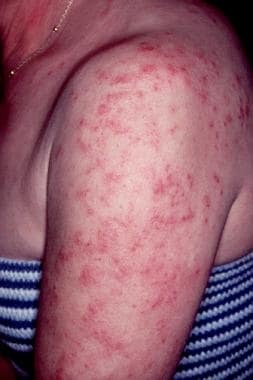 Callen JP, Klein J. Subacute cutaneous lupus erythematosus. Clinical, serologic, immunogenetic, and therapeutic considerations in seventy-two patients. Arthritis Rheum. 1988 Aug. 31(8):1007-13. [Medline]. Callen JP. Management of "refractory" skin disease in patients with lupus erythematosus. Best Pract Res Clin Rheumatol. 2005 Oct. 19(5):767-84. [Medline]. Callen JP. Cutaneous lupus erythematosus: a personal approach to management. Australas J Dermatol. 2006 Feb. 47(1):13-27. [Medline]. Huber A, Tüting T, Bauer R, Bieber T, Wenzel J. Methotrexate treatment in cutaneous lupus erythematosus: subcutaneous application is as effective as intravenous administration. Br J Dermatol. 2006 Oct. 155(4):861-2. [Medline]. Kreuter A, Hyun J, Altmeyer P, Gambichler T. Intravenous immunoglobulin for recalcitrant subacute cutaneous lupus erythematosus. Acta Derm Venereol. 2005. 85(6):545-7. [Medline]. Wenzel J, Brähler S, Bauer R, Bieber T, Tüting T. Efficacy and safety of methotrexate in recalcitrant cutaneous lupus erythematosus: results of a retrospective study in 43 patients. Br J Dermatol. 2005 Jul. 153(1):157-62. [Medline]. Kreuter A, Tomi NS, Weiner SM, Huger M, Altmeyer P, Gambichler T. Mycophenolate sodium for subacute cutaneous lupus erythematosus resistant to standard therapy. Br J Dermatol. 2007 Jun. 156(6):1321-7. [Medline]. Papulosquamous lesions of subacute cutaneous lupus erythematosus may simulate psoriasis. Annular lesions of subacute cutaneous lupus erythematosus.